At St. Mary of Pine Bluff Church, we encourage our parish families to present their newborn infants for the Sacrament of Baptism soon after birth, because this sacrament is the foundation of the Christian life. In Baptism the child, freed from original sin, becomes an heir to the Kingdom of God, receiving the theological virtues of faith, hope and charity and the gifts and fruits of the Holy Spirit. Through Baptism the child now has access to the other sacraments. Noah’s ark is seen as a prefiguring of salvation by Baptism, for by it a few were saved through water. When the Jews fled Egypt by crossing the Red Sea, Israel was liberated from the slavery of Pharaoh; in like manner, the baptized is freed from the tyranny of sin and Satan by the waters of holy Baptism. 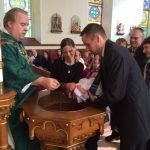 Arrangements for infant baptism must be made in advance. Please call the Parish Office at 608-798-4644 for more information. When making arrangements for the Sacrament of Baptism, we ask you to review the information about the Sacrament of Baptism before contacting the parish office.